When the decision is made to move a loved one to a retirement center, some downsizing will have to occur. Even a little two-bedroom bungalow can be twice the size of the apartment a new resident will now live in. Here are a few things to investigate when deciding what to bring to their new home. First things first, you’ll need to bring a bed to the new living space. But beyond that, what are the necessities? Some apartments can be close to 1,000 square feet – maybe even larger than the home they’re coming from. But others can be as small as 400 square feet. On the smaller size, a bedroom may only be 144 square feet. A queen size bed will take up nearly 25 percent of the room right off! A bedside table with a lamp and dresser will fit as well, but not much else. Remember, you need to be able to walk around the room, too. There might not be room for a chair or even a bench at the foot of the bed. Measuring the bedroom beforehand can give you a better idea of what comes and what goes. Full size appliance in an apartment can take up some room, too, so make sure to take that into account. Take note of counterspace – will there be room for a microwave and a toaster? Anything else? Make sure to find out what appliances are provided and which ones you’ll need to bring. Cupboard space may be at a premium, too, so consider paring down the place settings as well. Which brings us to the dining room table. Unfortunately, that 8-seat dining set probably won’t fit in the kitchen area alone, so a more modest table will have to do. Make sure there will be room to pull chairs out so people can sit down. Using 400 square feet as the baseline size for the new apartment, after the bedroom, bathroom and kitchen area are taken into account, you’ll be hard pressed to find room for a three-piece sectional sofa. Will the new resident want a recliner or two, or will a loveseat suffice? Small coffee table or a tv tray? End tables with lamps or stand alone lighting? These are decisions that will have to be made when moving into a small apartment. Of course, most apartments won’t be 400 square feet. But no matter the size of the retirement apartment, it will be tough to fit an entire house of furniture. Decisions will need to be made, sometimes very difficult decisions. But the most important thing to take into account is the comfort of your loved one. Making sure their new apartment isn’t cluttered with ill-fitting furniture is a good first step. 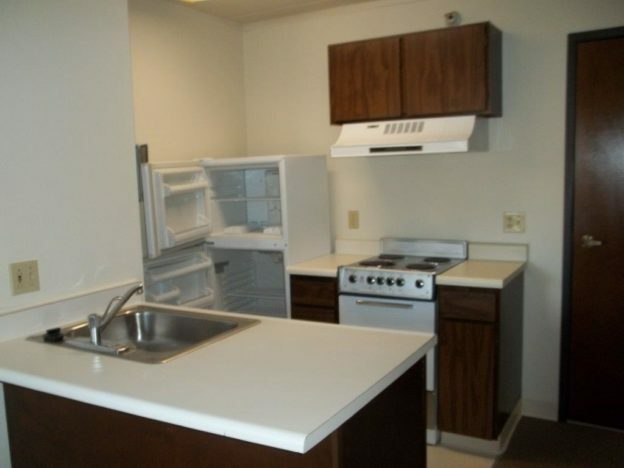 Knight of Pythias Retirement Centers offer unfurnished apartments equipped with a kitchenette containing regular sized appliances, a garbage disposal and pantry. Apartment sizes range from 400 square feet to 970 square feet. Contact Knights of Pythias Retirement Center for more information.